Of all the controversial topics addressed by this Turkish journalist over the years, one in particular got him into serious trouble. My greatest sin was to argue: "The fact that there are no Israeli casualties does not mean Hamas does not want to kill; it just means Hamas, for the moment, cannot kill." It was a beautiful, sunny day in December 2006 when I met Shimon Peres at his Tel Aviv office. At one point in our conversation, he began to talk about how things were beginning to go wrong in Turkey. He said: "Do not forget ... when holiness begins, reason ends." I knew he was right. In 2006, the then Prime Minister, Recep Tayyip Erdogan, was widely viewed as a Muslim democrat, a pro-EU reformist, a pro-business liberal; or, at worst, a postmodern Islamist — not just an Islamist. In reality, I argued in my Hurriyet column, he was just another Islamist zig-zagging between his ideological and pragmatic selves. He was successfully deceiving much of the Western world. Less than a decade later, having consolidated his power using a blend of nationalist, Sunni-Islamist rhetoric, populist sound bites and nods to Ottoman grandeur, he has been labelled "arguably the most virulent anti-Israel leader in the world." In Erdogan's Turkey, one can become a bête noire just for writing that Hamas is a terrorist organisation. At the end of the 15th century, Sultan Bayazid II embraced 250,000 Jews who had fled Spanish King Ferdinand's Inquisition. In his wisdom, the Sultan realised the Alhambra Decree of 1492 had merely impoverished Spain and enriched Turkey. Countless wars, the Holocaust and over five centuries later, in Mr. Erdogan's Turkey, one can become a bête noire just for writing that Hamas's charter and acts should qualify it as a terrorist organisation; that Jews do not belong to Alaska but to what is today Israel; that a suicide bomber who kills is just a suicide bomber regardless of his cause; and that Golda Meir was perfectly right when she said that "peace in the Middle East will come when Arabs love their children more than they hate us." Hate speech of every flavour and threats pouring into your inbox are part of daily life when you write a column viewed as "too critical of Erdogan" in the English-language pages of the country's biggest newspaper, Hurriyet. You can even smile and enjoy the rich spread of naive, ignorant and vulgar messages that come your way. It becomes so normal that by the time you sit down to start typing a new column, you have already forgotten about the stream of hatred. Within a few days, fresh bile will have piled up in your inbox. You keep smiling — and writing. Things took a different turn in the summer of 2014 when, spending time in my second home on a Greek island, friends told me that my picture was on the front page of the most militant Islamist newspaper, Yeni Akit — whose editors always find a seat aboard Mr. Erdogan's private jet during his state visits abroad. 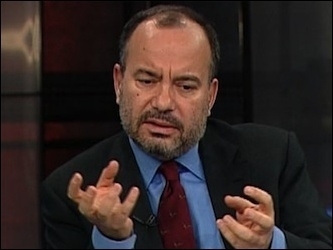 Figures close to Erdogan have called for the arrest of Hurriyet editor-in-chief Sedat Ergin. The "news" article called me "Aydin Dogan's Zionist Soldier of Fortune" (Mr. Dogan is the owner of the Dogan group that owns, among other prominent outlets, Hurriyet newspaper). Irrelevantly, I was accused of undermining Turkey's defence industry and promoting the Israeli weapons lobby. But my greatest sin was to argue: "The fact that there are no Israeli casualties does not mean Hamas does not want to kill; it just means Hamas, for the moment, cannot kill." Within 24 hours, Yeni Akit's story was picked up by a dozen or so Islamist and pro-government media outlets. After a pro-government columnist, in his tweet, called me "The disgrace of humanity," several others joined the lynching campaign on social media. "A sperm of Israel," someone wrote. Another said: "Enmity against Islam spills from his face." Someone else wished that I would travel to Gaza so that "the al-Qassam (brigade) could shoot him right in the middle of his forehead." Another campaigner invited "this ignoble, inglorious Zionist leftover to leave for Israel." Someone else wished, "May he and his family be bombed." And yet another offered a DNA analysis from a photograph: "He must be either Armenian or Jewish." Plenty of private email messages featured much less polite language and a diverse menu of threats. And why did I not file a complaint to the police or ask for protection? I was not sure who would protect me from the police. The campaign annoyed my editors and boss, but I kept writing provided that I would not write on "explosive" subjects. What were they? Well, you know. After a few attempts I stopped writing about the Arab-Israeli dispute. I did, however, continue to write on that subject for two other platforms: Daniel Pipes's Middle East Forum and Nina Rosenwald's Gatestone Institute. New rules meant that my column could no longer contain the words Jew, Israel, and Hamas. But things went from bad to worse in Turkey. 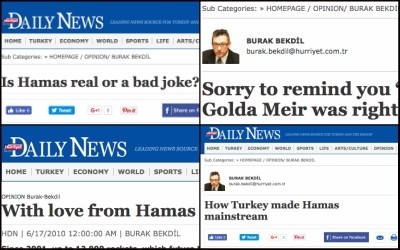 My editors, understandably, were under pressure not to publish even a few lines of jokes or criticism in a column devoted to a non-Arab-Israeli dispute subject. I got the message. The increasingly difficult rules meant that my column could not contain any of the words "Jew, Israel, Israeli, Hamas, Hamas and terror and Palestine." It worked. At least until December 2016, when my editors alerted me to a "very serious crisis that had terribly upset the big boss." What could it be, since my last column was about the assassination of the Russian envoy to Ankara by an Islamist police officer? Once again I was on the front page of a pro-Erdogan newspaper, Aksam. How dare I compare a government plan to introduce "youth branches" that would be affiliated to 45,000 mosques to the Hitler Youth? Enough, the big boss said. Fine, I said. That was the end of a relationship that dated back to 1987. Sad? Sad. Nevertheless, I felt lucky. In Erdogan's Turkey, I could have been prosecuted on charges of terrorism for writing that article.